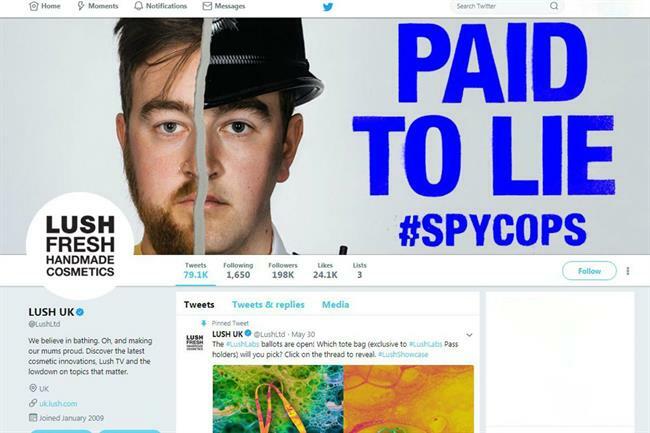 The new "#SpyCops" campaign from soap retailer Lush has been accused of being anti-police. The campaign aims to highlight the current Undercover Policing Inquiry, the government-backed probe into alleged instances of undercover police overstepping the mark to infiltrate the lives of activists. Lush is stocking postcards addressed to Home Secretary Sajid Javid, which members of the public can sign, asking him to make changes to the inquiry; for example, by releasing names of the officers and to extend the inquiry to Scotland. Lush, which is known for extolling its ethical credentials, is working with campaign group Police Spies Out Of Lives for the initiative. This has seen stores decked out in police-themed displays (image below is from Facebook group UK Cop Humour). The campaign has met with a fierce backlash, with the National Police Chiefs Council accusing Lush of being insulting and damaging towards the police. At the time of writing on Friday evening, a snap Twitter poll by Campaign's siter title PRWeek found 92% believe the campaign overstepped the mark. A spokeswoman for Lush said external agencies were not used in the campaign and added: "While intimidation of our shop staff from ex-police officers and unhelpful tweets from those in high office are ongoing, not all of our shops feel able today to have the campaign window in their shops. However the campaign is still running for three weeks and we will be constantly weighing up what to do about the situation." A spokeswoman also confirmed that external agencies were not used in the campaign." The campaign has received some support. Writing on Lush's website, the company has been praised for being "courageous" and the victim of people misunderstanding the meaning of the campaign. One commentator writes: "Good work, Lush. I don't know why people are seemingly willfully ignoring the message that you're sending - that you're not criticising all police and that this campaign is taking a stand on a specific and confined topic - but I guess social media pitchforks are quick to get brandished."